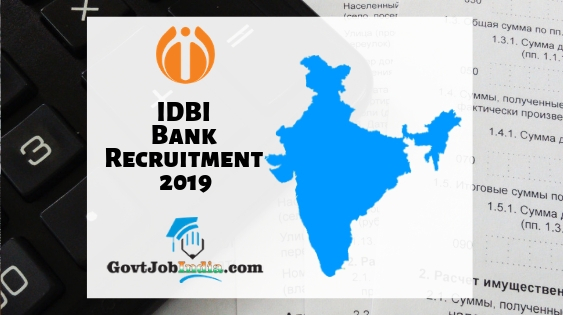 IDBI Bank Assistant Manager Apply Online– The Industrial Development Bank of India has just rolled out a recruitment notification for the appointment of 500 posts of Assistant Manager for the year 2019. All interested candidates are urged to apply online for the recruitment before the last date to apply for the IDBI Recruitment 2019. The application procedure has started and candidates are urged to apply online before 15th April 2019. Along with the, we have also attached the direct link to the IDBI Assistant Manager Application Form 2019. Please fill it up if you are eligible, and apply for this post because this is an amazing employment opportunity. The official website where you can find the details of this IDBI Careers is www.idbi.com. But, we have also given several of the details of the IDBI Bank Recruitment here on our page. It includes the IDBI Bank Assistant Manager Salary, Educational Qualifications, and the Apply Online link. Additionally, we have also created several other pages for the recruitment including the IDBI Bank Assistant Manager Exam Syllabus, Admit Card, Answer Key, and Result 2019. In case of any doubts regarding any of these, you can comment below and we will respond back as soon as possible. Furthermore, you would definitely know that a bank job in India, especially in the IDBI Bank, is a very good opportunity for your career. Candidates are advised to apply online as quickly as they can. So, now that you have come so far, let us finally move onto the recruitment details. We have given the detailed information about the IDBI Bank Assistant Manager Recruitment on our other page which is IDBI Bank Assistant Manager Syllabus and Exam Pattern 2019. Total 43553 before deduction in semi-urban areas. You will have to make an account on the official website of the IDBI website before applying for this recruitment. Start by registering yourself on the website with an apt Registration No. & Password. After successfully making an account, log on to the website and go to the “Career” part of the portal. Now click on the ‘Apply online’ link for the IDBI Assistant Manager Vacancy. Log onto the website using registration number & Password. Now fill the application form precisely and with great concentration and avoid any mistakes. Submit your duly filled application form and pay the application fee as per your category. Save this form and take a printout of it. Are you satisfied with the information provided about the IDBI Bank Assistant Manager Recruitment 2019? Did you find all the information which you need before applying online here on our page? If yes, then make sure to share this page with all those who might require this notification. This will help spread the word about the IDBI Bank Assistant Manager Vacancy 2019 and many of your knowns can also apply for this splendid chance. Furthermore, in case you have any doubts about the IDBI Recruitment 2019, leave it in the comment section below and we will address it as soon as possible. Lastly, our team collectively would urge you to subscribe to our website @ GovtJobIndia.com for latest updates about the newest vacancies spanning the nation.